The first part of the book delves into the details behind the failure of conventional treatments and provides a shocking portrait of just how unsuccessful current treatments are. This will provide invaluable guidance to cancer patients struggling with treatment decisions. It also shows how successful nutritional treatments have been in reversing cancers. When comparing success rates, nutritional treatments are the winners. The second part of the book provides an explanation of how cancer can be reversed naturally through diet and lifestyle changes. It details how the typical "healthy" American diet creates a toxic cellular environment which promotes cancer. It also explains how to change that environment in order to rebuild your immune system, while simultaneously changing the basic biochemistry of your body so it can fight cancer. 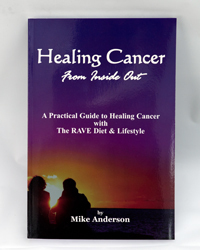 The remaining parts of the book explain the RAVE Diet, which has been tailored and optimized to fit the needs of cancer patients in order to get the maximum nutritional bang for the calorie buck. It is a how-to-book with practical tips and suggestions and over 200 recipes so you can easily make the RAVE Diet your everyday diet. And the simple Rules of Meal Preparation will show you how to prepare the meals you like very quickly without ever looking at a recipe. It also discusses the good, bad and ugly aspects of supplementation, why certain popular supplements should not be taken and why certain not-so-popular supplements should be taken. It also dispels some myths regarding supplements interfering with conventional treatments, as well as many other topics, such as the controversy over soy and breast cancer. The book is not only easy to read, but entertaining and inspirational. For anyone with an interest in cancer - or anyone interested in their health - this book delivers the goods. It may, in fact, be one of the most important books you'll ever read.